The HTML field is used to display descriptive text or HTML to form visitors. The text or HTML can only be inserted on the form builder and cannot be modified by users. An HTML field is commonly used to display static text instructions, a progress bar, or terms and conditions. Insert text or HTML in the Content box. The text or HTML will be displayed in your form. Use default values in an HTML field to display specific information. Open the Field Options. 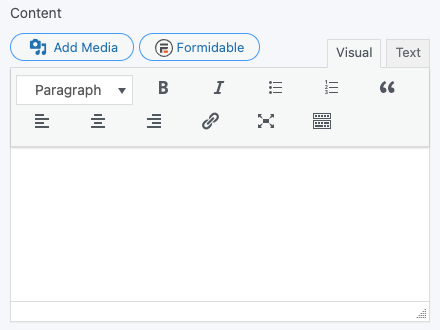 Insert any default value shortcodes in the Content box. An HTML field can be used to display values from other fields. When the value is in the same form, there must be a page break between that field and the HTML field. Then include the field id like  inside the HTML field. HTML fields do not accept field keys, conditional statements, or other shortcode options like views or email content. 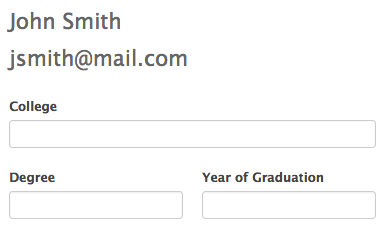 Instead, they get the exact value POSTed in the referenced field. 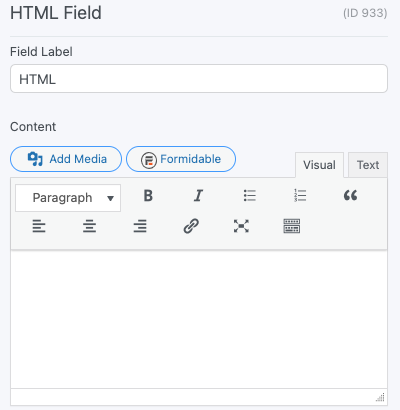 If conditional content is needed in an HTML field, use multiple HTML fields and add conditional logic so the content shows only at the times you would like it. If you would like to display a Formidable Forms graph inside of your form, follow the steps below. Go into the form where you would like to add a graph. Replace 'x' with the ID or key of the field you would like to graph. See the graphs page for more graphing options. Please note that the graph will only use entries that have already been submitted. Save the form and click 'Preview'. Now when the form is visited, a graph will be displayed in the form. Create a scroll box that holds terms and conditions. A required checkbox field will ensure that the user agrees to the terms and conditions before submitting the form. Go into the form where you would like to add the terms and conditions. Open the field options for the HTML field. Insert your terms and conditions in the Content box. Insert the frm_scroll_box shortcode in the 'CSS Layout Classes' box. This will turn the text into scrollable terms and conditions box. In the field options, select Required. Also, change the Label Position to None. Save the form and click 'Preview'. Now when the form is visited, the terms and conditions will be shown in a scroll box with a required checkbox field for the user to indicate their agreement.